Chateau Saint Pierre dates back well into the 17th century. We know this from several, historical documents on the St. Julien estate. It was first planted in 1693. Before that, the land was used a farm, At the time the documents were written, the property went by the name of Serançon. In those days, the De Cheverry family owned the Left Bank vineyards. Keep in mind, this was still about a century before the estate began going under the name of Chateau Saint Pierre. The reason for the name change was simple. It was named after its new owner, Baron de Saint Pierre who bought the estate in 1767. This was the birth of Chateau Saint Pierre. Upon his death in 1832, Chateau Saint Pierre was divided into two separate Saint Julien vineyards for his children. This led to the creation of Chateau Saint-Pierre Bontemps and Chateau Saint Pierre Sevaistre. Managing a vineyard was not something the children were equipped to do. Between selling off parcels and their lack of investment, by the 1920’s, less than 2.5 hectares of vines remained! Shortly after that low point, the vineyards came under new Dutch ownership by The Van den Bussche company and both estates were once again reunited. To add to the story, and bring us into the modern era, some of the better vineyard parcels were purchased by Alfred Martin, the father of Henri Martin. Henri Martin later added those plots to the vineyards for his other Saint Julien vineyard, Chateau Gloria. 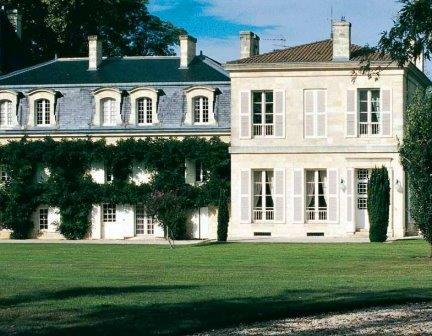 In 1982, Henri Martin purchased the Medoc estate of what was known as Saint Pierre Sevaistre. Henri Martin recreated and renamed the property, St. Pierre. Henri Martin was born into a family with deep roots in the Bordeaux region, as their history can be dated back more than 300 years. Through marriage and inheritance, Chateau St. Pierre remains in the hands of the Martin family. Today, Chateau St. Pierre is managed by Jean-Louis Triaud who is also in charge of Gloria and a few other estates as well. However, wine is not the only passion for Jean Louis Triaud, he is also the owner of the Girondins de Bordeaux, the professional football team of Bordeaux. Chateau Saint Pierre stays on top of the technology curve. Chateau Saint Pierre was one of the first estates in the Medoc to embrace the usage of satellite imagery to help identify which vineyard parcels are ready to pick. A complete renovation of the estate was finished in 2016. The renovation was designed by Alain Triaud. If the Triaud name sounds familiar, that is because he is the brother of Jean Louis Triaud, the owner of Chateau Saint Pierre. The 17 hectare vineyard of Saint Pierre is planted to 75% Cabernet Sauvignon, 15% Merlot and 10% Cabernet Franc. This shows a slight increase in the amount of Cabernet Sauvignon in the vineyards and an equal decrease in the amount of Merlot planted since the mid, 1990’s. At 17 hectares, Chateau Saint Pierre is the smallest classified estate in the appellation. The vineyard can be divided into 4 main blocks with parcels spread all over the appellation. The bulk of their vines are located close to the village of Saint Julien not far from Chateau Ducru Beaucaillou and Chateau Beychevelle. The vine density is 10,000 vines per hectare. The property has old vines. On average, many of their vines are close to 50 years of age. The terroir of Chateau Saint Pierre is gravel, sand and clay soils. In 2016, Chateau Saint Pierre finished a multi year long, complete renovation of the entire wine making facilities, vat rooms, cellars, offices, reception areas and tasting tasting room. Even though the chateau has new cellars, interestingly, the wine is not made at Chateau Saint Pierre. Due to a long standing arrangement in the St. Julien appellation, after harvesting, the grapes are transported to the chai of their other neighboring estate, Chateau Gloria, for vinification. To produce the wine of Chateau Saint Pierre and Chateau Gloria, the grapes are fermented in 76 different stainless steel tanks that range in size from 50 hectoliters up to 178 hectoliters. Malolactic fermentation takes place in barrel. The wine is then aged in an average of 60% new, French oak barrels for between of 14 to 16 months, depending on the style and character of the vintage. While there is no official second wine, declassified lots and young vines are placed into Peymartin, the second wine of Chateau Gloria. The best vintages of Chateau Saint Pierre are: 2018, 2017, 2016, 2015, 2014, 2012, 2010, 2009, 2008, 2006, 2005 and 1961. 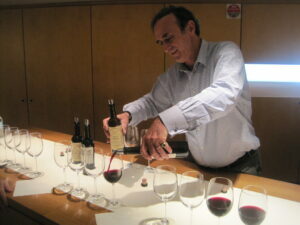 The Triaud family also produces the following Bordeaux wines; Bel Air from the Haut Medoc. From the St. Julien appellation, Peymartin, Haut Beychevelle and of course, Chateau Gloria. Interestingly, Chateau Saint Pierre remains one of the very few 1855 Classified Growth’s that does not produce a second wine. Production hovers close to 5,000 cases per year. Starting with the 2005 vintage, Chateau Saint Pierre began investing time and serious money in their vineyards and cellars to produce the best wine possible. The results speak for themselves. The wines of Chateau Saint Pierre have never been better. 2009 is an outstanding wine as well as the 2010 from St. Pierre. Chateau Saint Pierre can be enjoyed on the young side with a lot of decanting. Young vintages can be decanted for an average of 2-3 hours, give or take. This allows the wine to soften and open its perfume. Older vintages might need very little decanting, just enough to remove the sediment. Chateau Saint Pierre is usually better with at least 8-10 years of bottle age. Of course that can vary slightly, depending on the vintage character. Chateau Saint Pierre offers its best drinking and should reach peak maturity between 10-25 years of age after the vintage. Chateau Saint Pierre is best served at 15.5 degrees Celsius, 60 degrees Fahrenheit. The cool, almost cellar temperature gives the wine more freshness and lift. Chateau Saint Pierre is best served with all types of classic meat dishes, veal, pork, beef, lamb, duck, game, roast chicken, roasted, braised, stewed and grilled dishes. Saint Pierre is also good when served with Asian dishes, hearty seafood or richly textured fish like tuna, mushrooms, pasta and cheese. Dark in color, the wine is plush, ripe, fresh and loaded with sweet, blackberry fruits, espresso and earthy notes. The wine is medium/full bodied, soft and round, with an almost bright, fruityness in the finish. The wine was produced from 73% Cabernet Sauvignon, 21% Merlot and 6% Cabernet Franc. Dark in color, the wine is full, rich, deep, fleshy and round. The tannins are ripe and so is the fruit, which you can taste and feel to a much better degree, now that the oak program has been improved here. The wine ends with a long, black cherry, espresso, licorice and earthy component that hangs with you.. Dark, inky ruby in color, this wine is full bodied, concentrated, deep, long and focused. The fruit is precise, fresh and poised. The wine was produced from 73% Cabernet Sauvignon, 21% Merlot and 6% Cabernet Franc. Full bodied, concentrated, round and refined, the wine kicks off with a nose packed with espresso, licorice, cassis, blackberry and floral notes. The fruit is fruit, sweet and ripe. The finish is all about its sweet, ripe, polished, core of fruit with its smoke and espresso undertones. I really like the energy, refinement and almost lush textures on the palate found here. Round, lush and polished, with an espresso, licorice and dark cherry nose. The wine is focused on its ripe, dark red, sweet fruits, and round tannins in the finish. Forward drinking, the wine serves up a blend of licorice, menthol, plums and espresso. The wine has a roundness to its texture, but it is on the lighter side of the style range, which is typical for the vintage. The wine was produced from a blend of 70% Cabernet Sauvignon, 15% Merlot, 11% Cabernet Franc and 4% Petit Verdot. Lush, soft fruits, with a real sense of sweetness to the black cherry and boysenberries that are complicated by licorice, earth and smoky, espresso beans. There is a nice cocoa note in the finish. The wine was produced from a blend of 78% Cabernet Sauvignon and 22% Merlot. The nose pops with licorice, smoke, black licorice, coffee bean and mocha. Soft, round, forward and very nice for this difficult vintage, the wine ends with dark, fresh, black cherries. With a complex nose packed with mint, espresso bean, cocoa, blackberry jam, licorice and earth, the wine is big, rich, concentrated, long, polished and tannic. There is a lot going on here with this blend of 66% Cabernet Sauvignon, 28% Merlot and 6% Petit Verdot. 2009 St. Pierre continues on its path of improvement since 2005. Because the property is not as well known as many St. Julien wines, the wine remains well priced for its quality. In fact, along with Branaire Ducru, it offers one of the better deals for fine wine from the Medoc in 2009. With deep ruby hues, the wine smells of dark berries, cassis, anise, cracked black pepper, and oak. Rich, fresh, and round, this full bodied wine finishes with lush cassis, boysenberry, spice, and chocolate flavors. 94-96 Pts. It is going to take a bit more time for the remainder of the oak to fully integrate. The wine has volume, depth of flavor and soft, plush, polished tannins. Full bodied, round and loaded with tobacco stained, dark red, fresh, sweet fruits, another half a decade will get this where it needs to be. This is the success story of St. Julien. The property was known for producing a strong wine in 1961. It took close to 45 years before they began making strong wines. Since 2005, they have been getting better every year. Chocolate, coca powder, cassis, earth, sweet black cherry and coffee bean aromas were coupled with a long, polished, cassis and blackberry filled finish that will drink well young and age for at least two decades. Lots of easy drinking charm here. The wine is medium bodied, with mature notes of tobacco, flowers, espresso, cedar and red fruits. Soft, with a smooth, polished feeling to the tannins, the wine,with its red plum and cassis profile is fully ready to drink. Truffle, blackberry, smoke, menthol and herbs offer the aromatic profile. Soft and round textured for the vintage, the wine is approachable today with its fresh, sweet blackberry and cassis personality. Polished, round and supple in texture, this rich, ripe wine offers a lot of licorice, coffee bean, black cherry and earthy notes. It's soft enough to drink young, but time is only going to make it better. Fully mature, this medium bodied wine shows an earthy, oaky, black cherry driven character with tobacco and cocoa in the dusty finish. I've enjoyed subsequent vintages a lot more. Ripe, with licorice, coffee bean, blackberry and jammy, cherry notes in the perfume, the wine is lush, round and soft, with a plush, black cherry and oaky finsh. A bit overripe, with some heat and dryness in the tannins, the wine was much better on the nose than on the medium bodied, almost light palate. This is not a wine for further aging. While it will not fall apart in the near future, it is not a wine to hold for further evolution. Tobacco, cedar wood, earth, creme de cassis and blackberry scents open to a medium/full bodied wine that is ready to drink. While pleasant and with some charm, this is not at the level of wines being produced by the St. Julien chateau today. With the light color of a mature wine, tobacco, spice, cedar and cassis, medium body and a slightly, drying tart, cassis finish, this wine is past its prime. The wines being made today at this St. Julien property are not in the same styleas previous vintages and show a marked increase in quality and the ability to age and evolve. The best bottle of this wine I have ever tasted! This stunner kept getting better and better in the glass, for at least 3 hours. For a wine of this age, this says a lot. Fresh, long, concentrated and complex, there is a depth of flavor that lets all the cedar, tobacco, wet forest and red berries really shine. I am happy to have one more bottle remaining, I just hope it is as good as this one. Fully mature, this medium bodied, soft, delicate, tobacco, earth, cigar leaf and cherry filled wine should enjoyed sooner than later. That being said, it's probably a good 1961 to find at auction, as prices are low for a wine this nice. Surprisingly good, and filled with truffles, spice, cigar box, earth, black currants and cherry, the wine offers the silky, patina of age along with the earthy, spicy, tobacco laden flavors that can only come with serious bottle age. This is not going to improve, but it's great today. As Saint Pierre did not have much of a reputation in those days, if you're seeking a semi reasonably priced 1961 Bordeaux, this is probably available for a fair price.